Backyard Boot Camp: Banish Those Love Handles! How can you get rid of your “love handles?” Is the lower back fat, or love handles, a major problem area for you? It is impossible to “spot train” or shed fat deposits by targeting the love handles. However, it is possible and important to develop muscle in your problem areas including the lower back. Developing lean muscle increases the amount of calories you burn while stationary. The exercises in this Backyard Boot Camp to banish those love handles will strengthen your lower back, glutes, and abdominals. Developing lean muscle in these muscles is key to getting rid of your love handles. 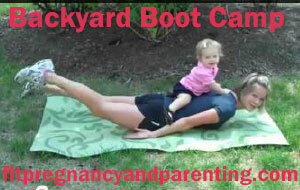 Pin this Backyard Boot Camp to your Pinterest fitness board and do it 5 times for more fat burning! Fit Preggo Stability Ball Workout! ha ha! love your guest star! Pinned! LOL thanks! It certainly made things harder with her climbing on my back, but we got through it! Haha. Ohhh this is perfect for me!! I love your creative workouts! I swear I need a pin board just for you! Haha! Spalove! OMG your guest star is super cute!! Great exercises. Can’t wait to try them! LOL thanks! Let me know what you think after you try it!